Father Christopher Jamison OSB spoke on “The Year of the Consecrated Life”. a monk of Worth Abbey, known for his part in two major BBC TV series which brought insights from the monastic tradition about contemporary culture, religious life and the future shape of the Church. Born in London on April 15, 1919, Meriol Trevor lost her father, an Indian Army officer, at an early age. Later she attended Perse Girls' School, Cambridge, and St. Hugh's College, Oxford because she loved to learn. Another love of hers was working outdoors as was evidenced by her managing a cargo barge on the Grand Union Canal during World War II. A convert to Roman Catholicism from agnostic humanism in 1950, Trevor imbued her children's stories and adult novels with a touch of religious perspective. Penning forty books over all including biographies of John Henry Newman and Pope John XXIII and stories for children such as Merlin's Ring and The Sparrow Child, Trevor became well-known. Moving to the city of Bath, she loved the architecture and enjoyed spending time with people. Trevor then passed away on January 12, 2000, and later that year to honour her, the annual lecture series began in Bath. 2015 Annual Catholic University Summer Reception 7th May. The sun came out for a couple of brief moments for the Annual Catholic University Chaplaincy Summer Reception at Prior Park College. The evening was full of happy students forgetting the gloom of dissertations and exams for a short time while they tucked in to food and wine as Father Bill's guests for the evening. They were joined by a host of people who help the Chaplaincy and Father Bill throughout the Year as Catholic Chaplain, including distinguished guests from Bath University and B&NES Council as well as the deputy Mayor. Important guests also included The Prior from St Mary's in London (Father Bill's Servite Priory) and other servite Brothers form London. 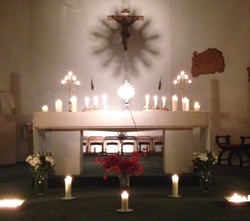 Students and friends of the Chaplaincy enjoyed a wonderful evening of Taize prayer around the cross last Thursday. Natalia gave a lovely presentation about her experiences in Taize with wonderful photographs showing her time there as a volunteer. Thanks to Father Bill OSM and all who who helped prepare the evening. Thanks for wearing your woolly hats in support of St Mungo's! Many thanks for wearing your woolly hats and eating woolly hat cakes this weekend at Holy Mass in support of St Mungo's. St Mungo's is a charity which helps to house, support and care for vulnerable and excluded people who either have been, or are at risk of, sleeping rough and becoming homeless all over the UK. In Bath, St Mungo's run Mulberry House in Weston which provides housing and support services for people diagnosed with severe and enduring mental health needs. The aim of St Mungo's is to make sure that homeless and excluded people can be helped to improve their quality of life. One of the younger parishioners at Ss Peter & Paul, Jess Gate chose this charity to help because St Mungo was the Confirmation Saint that she chose for her Confirmation name in 2013. A grand total of £430.14 was raised - Many thanks for helping with that great result!! 40 Hours of Adoration - if you missed it, you really missed out! Congratulations to everyone who supported the Forty Hours' Devotion, or Quarant' Ore at Ss Peter & Paul , Combe Down, Bath - a time of Prayer in common for the end of the Year of Faith - and to those who could come along and pray, and also to those who were not able to be with us physically, but who prayed at home with us. This wonderful Catholic exercise of devotion in which prayer is made for forty hours before the exposed Blessed Sacrament, was well supported by parishioners across the Deanery of Bath together with students of University of Bath & Bath Spa University and friends from all over the place. Hundreds of candles were burnt during these hours and donated flowers from parishioners and local businesses adorned the altar. Groups of children came for a special time of prayer and song and a simple time of devotion before the Lord, followed by chocolate cake, sweeties and a little fun together in the Apostles’ Room while others continued the Adoration in the church! University Students and parishioners and Father Bill OSM held the vigil through the weary hours of the Friday night, then taking it in turns to enjoy coffee and croissants in the early morning of Saturday before breaking to go to Perrymead for the Cemetery Chapel Deanery Mass led by Ss Peter & Paul Parish, and followed through during the following day and night. Father Bill OSM concluded the 40 hour devotion leading a wonderful Solemn Benediction with beautiful prayers, litanies, hymns and reverencing of the Blessed Sacrament with incense, leaving everyone hoping that this beautiful devotion will happen again soon at Ss Peter & Paul with a plan being explored to hold frequent but shorter Eucharistic all night Vigils involving students and parishioners from across the city of Bath and beyond. Adoration of the Blessed Sacrament has been taking place over the past fourteen years every Friday after 9.30am Holy Mass at Ss Peter & Paul, Combe Down until 11.00am and also on Bath Campus at 6.00pm on Thursdays as announced. Watch www.stspeterpaulbath.org.uk for updates on our plans and hopes as and when. “What will save the world? "My answer is prayer. Every parish should be held at the foot of Jesus in the Blessed Sacrament in the hour of worship." With a threat of war looming in Syria that may escalate, the Pope last Sunday asked us to observe Saturday, 7th September 2013, the Vigil of Our Lady’s Birthday, as a day of prayer and fasting to beg Almighty God for Peace in troubled regions throughout the world especially in Syria and the Middle East, invoking The Divine Mercy of Jesus and the maternal intercession of Our Lady, the Sorrowful and Immaculate Heart of Mary. Students and other young people and parishioners at Ss Peter & Paul together with friends from across the Deanery of Bath came together for Adoration and Evening Prayer of the Church until the Vigil Mass of Sunday 6pm and then from 7pm until Midnight enjoyed Silence, Readings and Song in the presence of Our Lord on the altar. On the eve of the feast of the Visitation of the Blessed Virgin to St Elizabeth on Thursday 30th May the young people of The Faith and Reason Group from Portishead with Tom & Nicola Osman visited Ss Peter & Paul, Combe Down, Bath for a Marian evening with other young people from Bath University for a talk on ‘Catholic Teaching about our Lady and an ecumenical reflection on the problem for some Christians about how Catholics think of her'. It was a great evening with excellent Fish and Chips, lively chat and even some music and prayer too. Father Bill presented each of the young people with a copy of Youcat and a Rosary. We hope to meet up again soon, perhaps taking some of our young people from Ss Peter & Paul and the Universities in Bath to Portishead. Click on the main picture of Our Lady and St Elizabeth to see more. 12th Peace Vigil on The Parade at University of Bath in the Peace Gazebo outside the Library 12.00-2.00pm on Wednesday 24th April. Catholic University Chaplaincy is holding the 12th Peace Vigil on The Parade at University of Bath in the Peace Gazebo outside the Library 12.00-2.00pm on Wednesday 24th April. All students and staff are always welcome to play a part however they wish and according to time. A simple, non-polemical occasion with hopeful contributions from all who come along. We have the benefit of the SU gazebo for a little protection against whatever weather conditions arise for the alfresco vigil on the Parade organised by Father Bill, OSM. Cathsoc and various Faith groups often play a part and also people with no particular religious or Faith view. The Student Union is always made aware of this important event. A good feature is the Peace Wall which you may sign if you wish. Come along even for 5 or 10 minutes! Please join in & do something for Peace! Father Bill, whose own Religious Order of Friars emerged from Civil Warfare in Florence nearly 800 years, ago says: "There is really little need to remind ourselves of the terrible plight so many people around the world suffer because of the lack of peace and justice. The scale of dreadful divisions between human beings at times loses our attention or overwhelms us, or do we simply prefer not to see? For peace to flourish we must make a simple start in our own hearts and learn to trust those who share our earth with us. We must long for peace and never forget those who suffer! Join us even for 5 or 10 minutes.” Solidarity! URGENT SPUC‘s annual Pro Life Chain Day Bath’s group of SPUC ((Society for the Protection of Unborn Children)) supporters stand each year on the London Road on the anniversary of the passing of the Abortion Law (1967) to support a National Chain. A group spokesperson says “We stand silently, with messages, three in total. ‘Abortion, one killed one wounded’. ‘Abortion, a baby can live without it’, ’Hurt by abortion? (a helpline number follows)’ We are not protesters, we are a witness to the injustice to the unborn and also to their mothers. We just place a window of light on the abortion issue to say that it has another side to the argument; also, I believe our presence gives those young and old who may be Pro-life but need it confirmed. On Sat. 27th April, we will stand from 11am-1pm. To be there the full length of time would be wonderful but for part of the time would be much valued too.” Contact Gail Mills (Chairman of Bath and Wansdyke S.P.U.C. Group.) on 01225833224 to let her know of your hope to be there and that she is not alone in this.